The 2014 Brookvale Show was on on a steaming hot Sunday on the 26th of October and Permaculture Northern Beaches (PNB) was right in the midst of it. This year it was all about the bees, all kinds of them! We had two wonderful honeybee keepers, showcasing award winning honey, candles and of course honeybees. Apart from the European honeybee (yes, it's an import), we also highlighted the importance of native bees. Our bee team leader Dan, brought a native stingless bee hive (Tetragonula carbonaria, Sugarbag bee) that certainly drew the attention of the crowd. The hive was bought as part of our Warringah Council grant that we were awarded this year to raise awareness about native bees and kick start a program to help multiply native stingless bee colonies here on the Northern Beaches. It was amazing to see the kids loose their initial shyness and get up really close to the hive with some squeaking "where are the bees, I only see ants" (the Sugarbag bee is much smaller than a European honey bee and completely black). Lots of mums and dads were surprised to see how gentle and harmless the bees were with some getting interested to know more about bees and how to get a hive for their backyard. The local aboriginal support group was awarded with a hive during the show and it will soon be placed it at a spot of indigenous importance within Warringah, so keep your eyes out for it! We also handed out information for our school art competition whereby two schools from the Warringah Council area can win a native stingless bee hive (check out our previous blog post on the details). Of course we did not leave out all those incredibly important solitary native bees we have buzzing around our backyards. Did you know that our love with well kept tidy back yards is actually destroying native solitary bee habitats? But you can attract the little pollinators back into your garden: All they need is a brick or a block of wood with some holes drilled into them or some bamboo tied in a bundle. Of course, if you want you can build a Bee Hotel as spectacular as ours (if you missed us at the Brookvale show, go and check it out at New Leaf Nursery real soon). Or just start small and place a small retreat in a corner of your yard. Your tomatoes will thank you! 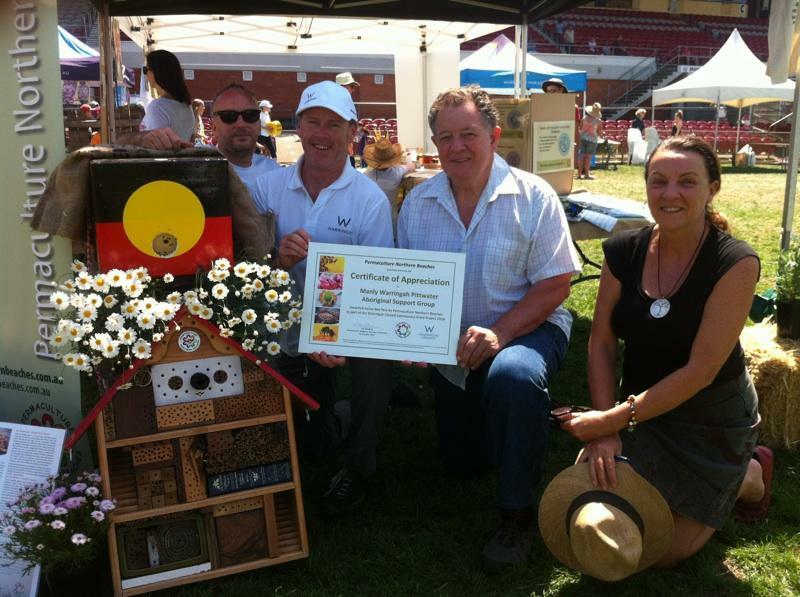 PNB and Warringah Council awarding Neil Evers and the Aboriginal Support Group, with 'Ngarruu' - a native stingless bee hive. If you want to know more about native bees, check out our newest fact sheet and get in touch if you want to get involved.